Pitchfork Supports Studios For Schools! 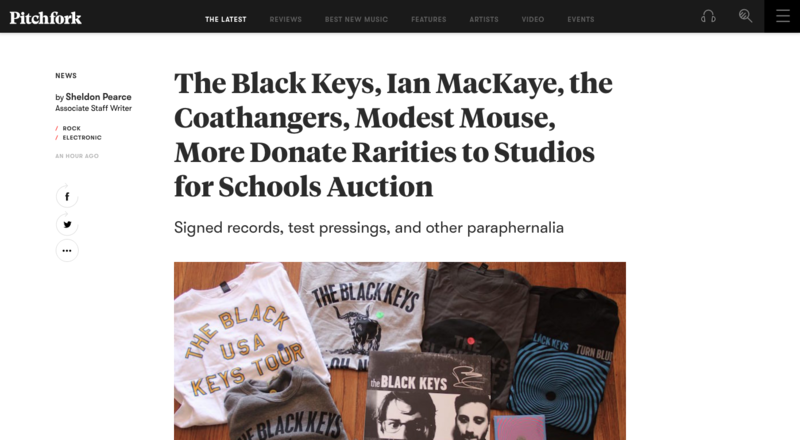 Items on the auction block include a Black Keys superfan pack with a signed copy of The Big Come Up, a Coathangers rarities pack that includes signed and test pressings of Nosebleed Weekend, a Burger Records starter pack with test pressings of Enjoy’s Another For Joyand Puzzle’s Soaring, a 12” test pressing of “Whenever You See Fit” by Modest Mouse, a 20 Years of Dischord box set signed by Ian MacKaye, and various other CDs and bits of paraphernalia. Find some images below and all of the listings for the auction here. Next Post New Console… Finally!